[S1230] 1900 US Census, Illinois, Cook County, Chicago, Washington, DC, ED788, Page 2B, Ancestry.com, accessed October 1, 2010. [S627] Illinois Statewide Marriage Index 1763-1900, online www.cyberdriveillinois.com/GenealogyMWeb/marrsrch.html, Dreijmueller-Treiber, March 23, 1895, vol. 1, page 87, license no. 1136, DuPage County, Illinois. [S309] US Social Security Death Index, 1935-Current, Ancestry.com, Ancestry.com, Mary Lieser, SS# 344-20-4360, accessed October 17, 2010. [S1247] Lieser-Dreimueller Marriage License, no. 446365: FamilySearch.org, Illinois, Cook County Marriages, 1871-1920. [S1244] Chicago Tribune, April 22, 1934, page 26, Proquest Historical Newspapers (1849-1987). [S1245] Katherine Lieser, Illinois certificate of birth no. 8090, FamilySearch.org, Illinois, Cook County Birth Certificates, 1878-1922, accessed October 10, 2010 (April 21, 1916). [S1248] Herbert Lieser, Illinois birth certificate no. 9510, FamilySearch.org, Illinois, Cook County Birth Certificates, 1878-1922 (May 5, 1907). [S1257] Herbert Leiser entry, Illinois, Cook County birth register page 191, FamilySearch.org, Illinois Cook County Birth Registers, 1871-1915, accessed October 11, 2010 (January 10, 1907). [S1249] Marion Lieser, Illinois birth certificate no. 9554, FamilySearch.org, Illinois, Cook County Birth Certificates, 1878-1922 (September 8, 1911). [S1266] 1920 US Census, Illinois , Cook County, Chicago, Washington, DC, ED 1569, Sheet 8B, Ward 26, Ancestry.com, accessed October 16, 2010. 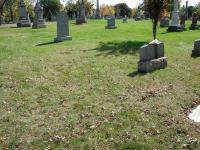 Paul Dreimueller's gravesite in St. Boniface Cemetery, Chicago, Illinois is unmarked. [S1263] Paul Dreimueller, Illinois death certificate, FamilySearch.org, Illinois, Cook County Deaths, 1878-1922, accessed October 15, 2010. [S779] Illinois Statewide Death Index (Pre-1916), Paul Dreimueller death certificate no. 2669. Speed Toll for 1924 Sent to 20 as Aged Man Dies. With the death yesterday of Peter Dreimueller, 75 years old, of 4026 North Maplewood avenue, the county's toll of death frm automobile accidents since Jan. 1 rose to a total of twenty. The aged man was fatally injured on Dec. 21 while crossing Irving Park boulevard at Maplewood avenue, he walked into the path of an automobile driven by Benjamin Langsford, 3753 South Wabsh avenue. A coroner's jury exonerated Langsford of blame. [S1258] Germany Births and Baptisms, 1558-1898, online FamilySearch.org, Family History Library, MF# 560650, Peter Dreimueller birth record, Accessed October 11, 2010. [S1258] Germany Births and Baptisms, 1558-1898, online FamilySearch.org, Family History Library, MF# 560650, Katholische Kirche Üxheim-Ahütte, Peter Dreimueller birth record, Accessed October 11, 2010. [S1259] Peter Dreimueller, Illinois Certificate of Death, Family History Library, MF#1877425, Illinois, Cook County, Chicago Deaths, 1924. [S1260] Chicago Daily Tribune, January 15, 1924, page 9, Proquest Historical Newspapers, accessed October 10, 2010. [S1240] Germany Marriages, 1558-1929, online FamilySearch.org, FamilySearch.org, MF#559037, accessed October 11, 2010. [S2743] Chicago Daily Tribune, June 28, 1916, Posted on Ancestry messsage board, 1999. [S2247] Illinois, Cook County Deaths, online www.familysearch.org, Margaret Madigan, death record 17 Mar 1934, Chicago, Cook, Illinois. Certificate #7786. Accessed on Ancestry.com January 17, 2019. 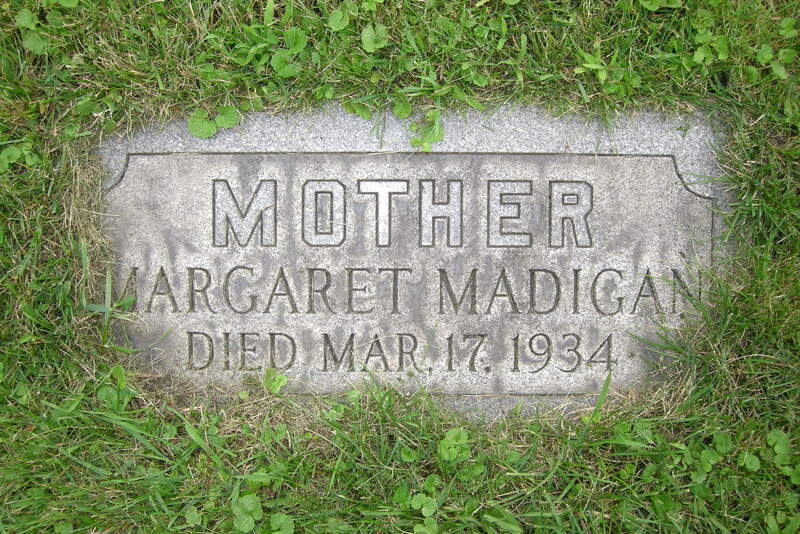 Death*: She died on 17 March 1934 at Cook, Illinois, U.S.A. MADIGAN - Margaret Drew Madigan, beloved wife of Michael, fond mother of Mrs. T. J. Owens, Michael J., John and Thomas Madigan. Funeral Wednesday at 10 a.m., from her late residence, 7146 S. Campbell av., to St. Adrian's church. Interment Mount Olivet cemetery, Stewart 7700. Chicago Tribune, March 20, 1934, page 26. [S796] 1930 US Census, Illinois, Cook County, Chicago, Washington, DC, ED 690, page 8A, Ancestry.com, accessed December 18, 2007. [S831] Madigan - Drew Marriage License: FHL #1030359. [S1197] William Madigan, Illinois Undertaker's Certificate and Record of Death, FamilySearch.org, accessed May 25, 2010. [S862] Marriage Register: entry for Michael Madigan and Margaret Drew, October 7, 1903 St. Patrick Church, Lemont, Cook County, Illinois, Micropublication #1571873, Family History Library, Salt Lake City, Utah. [S798] 1910 US Census, Illinois, Cook County, Chicago, Washington, DC, ED 262, Page 6A, Ancestry.com; accessed December 18, 2007. [S562] James Madigan, Illinois Certificate and Record of Death. [S1203] Thomas Madigan, Illinois Certificate of Birth no. 21053, FamilySearch.org, accessed May 26, 2010 (July 1, 1916). [S799] 1920 US Census, Illinois, Cook County, Chicago, Washington, DC, ED 1938, page 4B, Ancestry.com; accessed December 18, 2007. [S1346] Cook County Clerk's Office, online http://www.cookcountygenealogy.com, Margaret Madigan, died March 17, 1934, File # 6007786 accessed online March 23, 2015. [S2034] Marita Madigan McGiveney, "RE: Madigan pictures," e-mail to Elaine McIntyre Beaudoin, March 24, 2015. [S2035] Chicago Daily Tribune, March 20, 1934, page 26, ProQuest, accessed March 24 2015. [S1198] Mildred Madigan, Illinois Certificate and Record of Death, FamilySearch.org, accessed May 25, 2010. [S1098] Jeanette Bernice Dreymiller, Illinois birth certificate no. 14320, FamilySearch pilot project, www.pilot.FamilySearch.com, accessed February 27, 2009 (December 4, 1913). [S1255] Bernice Dreimuller, Dreimuller, Bernice death certificate, FamilySearch.org, Illinois Death Records, accessed October 9, 2010. [S1233] Du Sartz Family Tree, "Bernice Johnston Family Group Sheet", Accessed, October 2, 2010. [S2375] 1900 US Census, Illinois, Cook County, Evanston, Washington, DC, ED 1158; Page 6A, Ancestry.com, accessed August 17, 2016. Marriage*: She married John O'Laughlin.